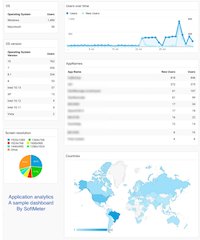 SoftMeter is a software usage analytics library for Windows, MacOS and IOS that allows software developers to send "pageview", "event", "screenview" and "Exception" hits from their programs to their Google Analytics profile. With SoftMeter, shareware authors can see the active installations of their programs in the same way they see the visits to their website. The following checklist will guide you to add SoftMeter's application analytics to your application. Inside your GA, create a new property, name it after the name of your software. Best practice: Each software product you have should have its own GA property to allow easy separation of statistics. You will be asked to select the reporting type between "Website" and "Mobile App". Here is a comparison of the two reporting view types. Select "Website" because "Mobile App" will require to fill in details about your firebase app, which you don't have. Later, you can still create a "Mobile App" reporting view (if you want to send "screenView" events from your application). Write down the property ID number. B3 Download our demo application and the SoftMeter library. Use your new property ID to send test hits to the reporting view. B5 Success level 1 reached: You have a new GA property for your software, and you have sent test hits from SoftMeter. Now, you just need to send these hits from your own application. C3 If you are implementing runtime software analytics inside your software, see our examples. You can start with a minimum of calling the sendScreenView() function on application launch. C4 Run your installation package or your software to see the hits arriving at your GA reporting. C5 Add a paragraph in your EULA and a screen at the UI of your application to notify the users about the telemetry. Download this sample telemetry consent EULA that you can use as a template to write your own. C6 Success level 2: Well done. D2 Check our GitHub space and our news for the latest version of SoftMeter. If a new version exists, you just need to replace the SoftMeter DLL (or dylib on Mac) with the new file. D3 Do you normal quality checks and publish the new release. D5 Success level 3: You are a hero. Modest or not, the truth is that you brought new information, of high value to your software development house. - work with focused effort. Take some screenshots or print-outs of your first reports, for your fellow developers and the management team. Take our template reports and dashboards from the GA reports gallery and import them into your GA property. We created these reports and dashboards to get you started quickly. From our templates, you can observe the key metrics of your software. E2 At any time you can also build your own custom reports, or even take the data to Google data studio to perform an advanced analysis. E3 If you only implemented Installation analytics, consider adding SoftMeter also in your application. If you only implemented SoftMeter in your application, consider adding it also in your setup package. E6 Success level 4: By using our library, and optionally buying the Pro edition, or donating to this project, you increased our development happiness. You can send data to a new or to an existing Google Analytics property. I recommend that you start with a new property (under the same GA account). It takes less than 3 minutes to create it and you can discard it anytime if you finally do not need it. A new properly allows you to quickly focus on the data sent from your application during your tests and the first release. The general recommendation is: one property for every software product that you want to track. All GA properties can be under the same GA account. Under the new property, I recommend you create a "Mobile App" type of reporting view. Step 2. Send "pageview", "event" and "screenview" hits to your property to verify they are collected ok. Step 3. Save the library file (.dll or .dylib) next to your program's executable or in a relative folder. Chose the appropriate library that matches your program: 32 or 64 but DLL for Windows, the 64-bit dylib for Mac. Step 4. Include in your source code the ready files. For C++ Windows and/or Mac software: example files. For Delphi/Pascal console software: example files. For Delphi/Pascal GUI software: example files and blog article. For Inno Setup (installer package): example files and blog article. Step 5. Place calls to initialize and finalize the library. Step 6. Place some calls to send "pageviews", "screenviews" or "events" to google analytics. On Google Analytics if you are using a "Website" type of reporting view, then your program should send PageViews and Events. On Google Analytics if you are using a "Mobile App" type of reporting view, then your program should send ScreenViews and Events. Step 7. Login to google analytics and watch the hits. Go to the real-time view of Google Analytics and run your program. See if the hits arrive in G.A. Examine the log file for any errors. Step 8. Adapt the hits according to your monitoring needs. After you start seeing in G.A. the hits coming from your program, you can adapt your calls to the library to use a combination of Pageviews and Events or Screenviews and Events. Step 9. Add a paragraph in your EULA and the UI of your application to notify the users about the telemetry. See this sample telemetry consent EULA that you can use as a template to write your own. Also, you must give a choice to your users to opt-in or opt-out, something like a radio button under your Settings or About menu. According to the new GDPR EU law (May 2018), users must opt-in by themselves. Step 10. Include the library file in your installation/distribution package. Include the library file in your installer and do a full test as an end user. You can rename the library file if you wish to do so. If for some reason a user deletes the library or if you omit it from the installation, the example code we gave, gracefull disables the SoftMeter API functions so that your program will not misbehave. The API functions will return "false" as a result. Something not working? Need support?. If you meet difficulties, do not hesitate to contact us.